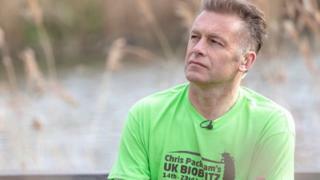 Naturalist Chris Packham is urging farmers to turn their farms into wildlife havens because "nature reserves are not enough". The BBC Springwatch presenter visited Papley Grove Farm near St Neots in Cambridgeshire as part of his 10-day UK BioBlitz survey. He said: "The UK's landscape is in big trouble... we want wildlife everywhere. "We need to appreciate the role of farmers in protecting and supporting wildlife." The survey will see experts record all forms of wildlife across 50 sites in the UK. It is designed to create a benchmark to help measure the rise and fall of different species. Papley Grove is the only farm to be visited as part of the survey and is owned by Martin Lines, chairman of Nature Friendly Farming Network. The network was set up earlier this year to champion a way of farming that is sustainable and good for nature. Mr Lines said: "Our efforts are irrelevant if other farmers do not recognise a shift to nature friendly farming." More than 70% of the UK is farmland, but farm bird numbers have dropped by 54% since 1970 and farmland butterflies by 36% since 1990, according to the British Trust for Ornithology. Brian Finnerty, spokesman for the National Farmers Union East Anglia, said: "We would welcome the opportunity to show him [Mr Packham] the steps farmers are already taking on farms across East Anglia, alongside producing quality food. "These include creating grass margins around fields, placing buffer strips next to watercourses, planting pollen and nectar mixes for bees and putting skylark plots within arable crops. "But we must ensure we retain a profitable and productive farming sector."